Copyright © 1997, 2000, 2002, 2005, 2006, 2008 by Aaron Shepard. May not be published or posted without permission. PREVIEW: After gaining both immortality and magic powers, Monkey challenges Heaven itself. Far across the Eastern Sea, on the island called the Mountain of Flowers and Fruit, a magic boulder had sat on the mountain’s peak since the creation of the world. Bathed in the energies of Earth and Heaven, quickened by the light of Sun and Moon, the stone became fertile, and at last cracked open to release its young. From this stone egg emerged a full-grown monkey. As it gazed about and above, golden light shot from its eyes to the farthest reaches of Heaven and Earth. High above in Heaven, the Jade Emperor, Ruler of Heaven and Earth, was startled by the rays of light reaching his Celestial Throne. “See what’s causing that,” he ordered his chief minister, the Spirit of the Great White Planet Venus. Elsewhere in Heaven, Lord Lao Tzu, Supreme Patriarch of the Way, was refining Elixir of Life, when just for a moment the golden rays penetrated his alchemy laboratory. Far off in the Western Paradise, the Buddha paused in his blessed discourse to his disciples as the rays of light shone into the temple hall. He closed his eyes a moment in silent meditation, then turned to Kwan Yin, Most Compassionate Bodhisattva and Goddess of Mercy. And so saying, he resumed his blessed discourse. On the Mountain of Flowers and Fruit, in the Heavenly Cave of the Water Curtain, the island monkeys were feasting to celebrate the birthday of their king. But the Monkey King himself sat there gloomily. “What’s wrong, Your Majesty?” asked an old gibbon. The very next morning, the Monkey King ordered a pine raft to be built and loaded with fruit for the journey. Then he took leave of his cheering subjects, floated downstream to the island’s edge, and started across the great sea. On the Mountain of Heart and Mind, the Monkey King stood before a double door in the mountainside. Beside it was a huge stone tablet carved in ancient characters. “This is the place!” said the Monkey King. “Right where the woodcutter told me. I just hope I look all right in these human clothes.” He glanced down at what he’d gathered on his journey—black boots, red robe, and yellow sash. Just then, one of the doors opened and a young man peered out at him. “You can’t be the one!” he exclaimed in horror. “What one?” asked the Monkey King. “That’s me!” said the Monkey King. They walked down a stone corridor and into a large chamber, where thirty or forty disciples faced a dais made of jade. Sitting cross-legged on the platform was a man who looked as old as Heaven, yet strong and healthy. His flowing beard trailed away behind him. So Monkey became a student of the Way. Each day, he studied scriptures, discussed doctrine, and listened to the discourse of the Patriarch. The rest of the time, he swept the cave, helped in the vegetable garden and orchard, gathered firewood, and carried water from the stream. Days went by, then weeks, then months, then years. One day during the Patriarch’s discourse, Monkey grew so excited that he could not contain himself. With his eyes closed, he got up on all fours and began leaping and turning. So the Patriarch whispered into Monkey’s ear. For three months, Monkey practiced the techniques in private. Then one day, as he walked back from his chores in the orchard, the Patriarch came up to him. “Not likely!” said the Patriarch. Then the Patriarch taught Monkey how to somersault high into the air, land on a magic cloud, and propel it across the sky with more somersaults. Another three months passed while Monkey practiced. Soon he could travel for hundreds of miles with each somersault. Then one day the Patriarch paused in his discourse and addressed Monkey again from the dais. He thumped Monkey on the head three times. Then, with his hands held behind his back, he stomped into his private chamber and slammed the door. But Monkey just sat there grinning. Late that night, Monkey crept from the disciples’ sleeping place, out the front door of the cave, and around to the back. There he found the Patriarch’s door left open a crack. “Come in, Monkey,” came the Patriarch’s voice. Monkey slipped inside. In the candlelight, he saw the Patriarch sitting cross-legged on his cot. And so the Patriarch revealed his precious wisdom. But what he said must not be written here. For three years Monkey practiced the secret techniques. His body grew hard and enduring and full of powerful energies. Then one day, he was sitting with the other disciples outside the cave. “I certainly can,” said Monkey proudly. “We won’t believe it till we see it,” said another. “Then just watch this,” said Monkey. He called out, “Change!” And there in place of Monkey stood a unicorn! “Bravo! Bravo!” yelled the students. They cheered and applauded as Monkey changed back and took a bow. “Master, where would I go?” said Monkey in alarm. “Master, I promise,” said Monkey. “Good-bye, Master.” Then he somersaulted into the air, landed on a magic cloud, and flew off, head over heels. At the bottom of the Eastern Sea, before the green jade palace of the Dragon King, Monkey marched up to a cowrie shell gate where a Dragon Captain stood guard. The captain stared in amazement. “Yes, sir!” said the captain, saluting smartly. In a few minutes, the captain was ushering Monkey into the throne room. “Don’t mention it,” said Monkey. “It just doesn’t feel right,” said Monkey. The queen bowed graciously to Monkey and took her leave. “Bring it out and we’ll have a look,” said Monkey. The Dragon King led Monkey across a courtyard and into the treasury, then pointed out a pillar of black iron. It was twenty feet high and as thick as a barrel, and both ends were tipped with gold. As Monkey approached, the pillar began to glow. “It likes me!” said Monkey. He examined the pillar closely and found characters inscribed near the bottom band. Monkey put both hands on the pillar and lifted it. The Dragon King gasped. At once, the staff shrank to 15 feet and became thinner too. It shrank to 10 feet. Monkey said, “I believe this little beauty will do anything I want.” He called out, “Grow!” Both Monkey and the staff shot up to over two hundred feet tall. “Take this! And that!” he shouted, swinging at an imaginary foe. The water swirled so furiously, it nearly swept away the Dragon King. Then Monkey called “Shrink!” Monkey and staff returned swiftly to normal height. “Smaller!”—and the staff alone became the size of a needle. Monkey lodged it safely in his ear. “Don’t mention it,” said the Dragon King. And with a leap and a somersault, Monkey was gone. On the surface of the Eastern Sea, not far from the Dragon King’s palace, Monkey landed lightly on a barren rock that jutted above the waves. Stretching himself out on it, he yawned and then studied the sky. He closed his eyes and quickly drifted into sleep. All at once Monkey felt himself jerked to his feet. Two men were clutching his elbows. One man had the face of a horse, the other had the head of an ox. “That’s right,” said Monkey, in a daze. They started to drag him off. Stumbling once, Monkey happened to glance back. There he saw himself, still lying on the ground! “He wants to know how he got here!” snorted Horse Face. “You got here the same way as everyone!” said Ox Head. After a while they came to the wall of a city. Above the gate was an iron placard with characters inlaid in gold. “That’s what they all say!” said Horse Face. “Tell it to the judge!” said Ox Head. “All right, I will!” said Monkey, snatching his staff from its hiding place in his ear. “Grow!” he cried, and in half a moment he was swinging five feet of it. “We didn’t mean it!” cried Horse Face, fleeing through the gate. “Can’t you take a joke?” said Ox Head, racing after. Monkey followed them in, still swinging his staff. The demons of the city were terrified, and not one of them dared get in his way. By the time Monkey reached the Palace of Darkness, Lord Yama and the other nine Judges of the Dead were waiting on the steps. “Sir, what seems to be the trouble?” asked Yama nervously. Yama led him into the Hall of Darkness, where a clerk dragged out several musty volumes. Monkey searched till he found his name. “Writing brush!” commanded Monkey, and the clerk gave him one dipped in ink. Monkey blotted his name from the register. “That should do it,” he said. “This is most irregular!” protested Yama. “Tell it to the judge!” said Monkey. He slammed the book shut and rushed out. Then he made his way back to the city wall, swinging his staff as he went. Just outside the gate, Monkey tripped and fell rolling. When he opened his eyes, he was back on the rock in the Eastern Sea. High above in Heaven, at the Cloud Palace of the Golden Doors, in the Hall of Divine Mist, the Jade Emperor, Ruler of Heaven and Earth, was having a bad day. He had spent his whole morning stamping his official seal on documents promoting or demoting heavenly officials. In the afternoon his wife, the Lady Queen Mother, had demanded his help with the invitation list for the Grand Banquet of Immortal Peaches. And now both the Dragon King of the Eastern Sea and Yama, Lord of the Dead, stood before him complaining of some kind of monkey who had become immortal, with power enough to threaten them both. No sooner had the Dragon King and Yama left the hall than a lieutenant rushed in and bowed to the ground. “Remarkable,” said the Jade Emperor, looking Monkey up and down. “I’m not so sure about that,” muttered the Jade Emperor. At the Imperial Stables of the Jade Emperor, a banquet of welcome and congratulation was being held for the new Protector of Horses. In just a few weeks of Monkey’s care, the thousand heavenly coursers and chargers had begun to grow sleek and muscular. The officials under him liked him as well, and so had gathered in his honor. “But I haven’t had an invitation,” said Monkey. He rushed outside, somersaulted onto a cloud, and sped off. At the Pavilion of the Jade Pool, servants ran about, busily setting the tables. From where he had landed nearby, Monkey could see trays loaded with Immortal Peaches, and bowls brimming with Pills of Immortality. There were also large pitchers filled with juice of jade, and heaping plates of delicacies like unicorn liver and phoenix marrow. Monkey’s mouth watered. “I won’t bother waiting for the other guests,” he said. “Change!”—and he became an exact image of the Spirit of the Great White Planet Venus. “What in Heaven could that be about?” said the head steward. “All right, we’d better not dally.” And all the servants rushed off. As soon as Monkey was alone, he changed back to himself and started grabbing peaches right and left. They tasted so heavenly, he wanted to eat them all—but since there were so many, he took just a bite or two from each one. He guzzled the jade juice and bolted down whole plates of delicacies. And he popped Pills of Immortality into his mouth like peanuts. At the Cloud Palace of the Golden Doors, in the Hall of Divine Mist, the guests of the Lady Queen Mother had gathered to await the Grand Banquet of Immortal Peaches. Nearly all of the most important divinities were there, including ministers from all departments of the heavenly administration, heavenly generals, many star and constellation spirits, and a number of Bodhisattvas and Immortals. Seated beside the Jade Emperor and the Lady Queen Mother were Lord Lao Tzu, Supreme Patriarch of the Way, and Kwan Yin, Most Compassionate Bodhisattva and Goddess of Mercy. At the Pavilion of the Jade Pool, Monkey had eaten as much as he possibly could and was patting his stomach in satisfaction. But a moment later he looked nervously at the scene around him. Mighty Miracle rushed at Monkey, who grabbed his staff from his ear and called, “Grow!” Just in time, he blocked the swing of Mighty Miracle’s ax. “You’ll have to do better than that!” said Monkey. Mighty Miracle swung again and again, but Monkey parried every blow. Soon they were moving so fast, their arms were just a blur. Mighty Miracle bellowed, “Let’s see if you can face my magic powers! Grow!”—and he shot up to over a hundred feet tall. “I know that trick too!” called Monkey. “Grow!”—and he was once more face to face with his opponent. The noise of their battle was deafening, and their movements raised a wind that nearly blew away the twelve Thunder Generals. But neither could gain an advantage. All at once Monkey cried, “Shrink!” and somersaulted into the air. At normal size, he sailed right by Mighty Miracle’s battle-ax. He brought his staff down squarely on the Heavenly General’s shoulder as he passed over it. Mighty Miracle roared with pain, then quickly shrank to normal size and retreated. Now the twelve Thunder Generals surrounded Monkey and attacked him with their battle-axes, swords, lances, halberds, maces, and scimitars. Monkey whirled like a top, countering every blow. But after a while he grew tired. He yanked a dozen hairs from his tail, threw them in the air, and cried, “Change!” Each hair became a monkey that swung an iron staff against one of the Thunder Generals. “Now I can take a break!” said Monkey. He put his staff away in his ear and stood grinning in the midst of the battle. At that moment, the Imperial Chariot arrived at the pavilion with the Jade Emperor, the Lady Queen Mother, Lord Lao Tzu, and Kwan Yin. Kwan Yin stamped her foot, rose a hundred feet in the air, and landed on a magic cloud. Then taking careful aim, she dropped her vase right onto Monkey’s head. Monkey dropped unconscious to the ground. The fighting monkeys at once changed back to hairs, returning to his tail. Kwan Yin retrieved her vase and landed back in the chariot. “Well done!” declared the Jade Emperor. “It is not worth mentioning,” replied the Bodhisattva. “Then what are we to do with him?” asked the Jade Emperor in dismay. In the alchemy laboratory of the Cinnabar Palace, Lord Lao Tzu, Supreme Patriarch of the Way, dumped Monkey into the Crucible of the Eight Trigrams, clamped down the lid, and lifted the crucible onto the hearth. In a flash the staff enlarged to five feet, pushing against the bottom of the crucible and shattering the top. As Monkey jumped out, he knocked over the astonished Supreme Patriarch, sending him head over heels. Monkey ran in a blind rage all the way from the Cinnabar Palace to the Cloud Palace of the Golden Doors, brandishing his staff at every heavenly official along the way. At the palace steps he found the Heavenly General of Mighty Miracle and the twelve Thunder Generals, who all grew pale at the sight of him. In the Hall of Divine Mist, the Jade Emperor could hardly believe the message he had heard from the Heavenly General. Moments later, the Spirit of the Great White Planet Venus was speeding on a magic cloud out the West Gate of Heaven. It was not long before he reached the Western Paradise, where he landed on the Mountain of Miracles and entered the Temple of the Thunderclap. Outside the Cloud Palace of the Golden Doors, Monkey marched up and down, swinging his staff, till his patience ran out. But just as he stepped forward, a magic cloud landed in front of him. Off it stepped a huge man in the robe of a monk. “You can make good on your promise?” asked Monkey. Monkey put away his staff and jumped onto the Buddha’s palm, which was the size of a lotus leaf. Then he gave the mightiest leap of his life. Head over heels Monkey tumbled through the air, spinning like a windmill for hundreds, thousands of miles. At last he came to five olive-colored pillars reaching high into the sky. He returned the hair to his tail, gave another mighty leap, and moments later landed back in the Buddha’s palm. But before Monkey could leap again, the Buddha turned his hand over, thrust Monkey out the West Gate of Heaven, and pushed him down to Earth. The hand turned into a five-peaked mountain which pinned Monkey between stone walls. His head and arms were out, but the rest of him was hopelessly trapped. “And how will that come about?” asked Kwan Yin. “The compassion of the Buddha is beyond measure,” said Kwan Yin. Buddha and Bodhisattva smiled at one another and touched hands lightly. Far ahead, the Temple of the Thunderclap gleamed in the setting sun. Monkey is the most popular figure in all Chinese literature, loved for centuries by young people and adults alike. His story is found in a classic sixteenth-century novel, The Journey to the West (Xi You Ji or Hsi Yu Chi), as well as in countless later adaptations, from Chinese opera to comic books. 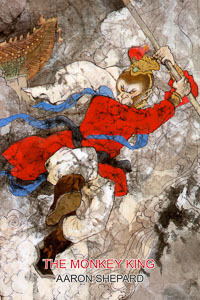 The novel, written anonymously but often attributed to the humorist Wu Cheng’en, is an epic comic fantasy of 100 chapters. My retelling covers only the first seven chapters, which form a kind of prelude. The bulk of the novel recounts the journey of the Buddhist monk Sanzang to collect sacred scriptures from Buddha in the Western Paradise, aided by Monkey and several other magical creatures. Monkey’s adventures provide a breathtaking, whirlwind tour of Chinese mythology, with its rich amalgam of Buddhist and Taoist elements. Here are notes on some of these. Jade Emperor, Heaven. Though the Jade Emperor is ruler of Heaven and Earth, he is not so much a supreme God as a supreme administrator. In fact, he is outranked by the three top divine beings of the Chinese pantheon, Buddha, Lao Tzu, and Confucius—who are themselves subject to higher universal forces. The Chinese Heaven is modeled closely on the government of the Chinese emperors. In other words, it is a bloated bureaucracy, crammed with innumerable officials with pompous titles, with a finger in every possible earthly activity. Lao Tzu, Immortals, Patriarch Subodhi. Centuries before Taoism was established as an organized religion, it existed as a spiritual discipline similar to the yoga systems of India. (Tao is pronounced “DOW,” rhyming with “cow.”) The followers of this branch of Taoism, represented in the story by the Patriarch Subodhi and his disciples, were ascetics living in mountain hermitages. These ascetics aimed to become “Immortals” by developing conscious spirit bodies that could transcend death. But for most Chinese, this was simplified into the belief that Taoist masters achieved physical immortality. The founder of Taoism is said to be Lao Tzu, who became known as a divine being. He is thought to have lived around the 5th or 6th century B.C., though we cannot be sure he actually lived at all. He is also supposed to have written the Tao Te Ching (“Book of the Way”), the primary text of Taoism and the most famous of all Chinese classics. Buddha, Bodhisattva, Western Paradise. Buddha, or the Buddha, is the title given to Siddhartha Gautama, founder of Buddhism, now revered as a divine being. He lived in India from around 563 to around 483 B.C. The title means “Enlightened One” or “Awakened One.” As such, it is often applied by Buddhists not only to Siddhartha but to all who attain his state of mind—a state that is said to bring a perception of the true nature of reality and a release from the need for additional lives. Bodhisattva is a related title for one who has become enlightened but remains on earth to help others toward that goal. The Western Paradise is where good Buddhists are taken after death—a congenial place where they can progress more rapidly toward becoming Buddhas themselves. This is the teaching of the “Pure Land” school of Buddhism, which predominates in East Asia. In The Journey to the West, the Western Paradise is also the present home of the Buddha and seems to be somewhere in India. Kwan Yin (or Kuan Yin, or Guan Yin). The Bodhisattva Kwan Yin, commonly called the Goddess of Mercy, is China’s favorite divine being—much more widely loved and worshiped than the Buddha, Lao Tzu, Confucius, the Jade Emperor, or any other. Her name means “heeding the cry.” She hears and helps all those who cry out to her in need, and also delivers babies to their mothers. Dragon King of the Eastern Sea. In Chinese mythology, dragons are in most cases benevolent. They live underwater and are found in every good-sized lake and river. They can also fly, as they do while performing their main job, which is to bring rain. There are four dragon kings, headed by the one in the Eastern Sea. Their magnificent palaces and treasure hordes are legendary. Yama, Judges of the Dead, Land of Darkness. The Land of Darkness is the Chinese Hell. It is not underground but in a kind of parallel dimension. When people reach their fixed times of death, demon officials arrest their spirits and bring them before Lord Yama, the First Judge of the Dead. If their good deeds balance or outweigh their evil ones, they are sent directly to the Tenth Judge for rebirth. Otherwise, they must first pass before the other judges for punishment of various kinds of wrongdoing. Especially good spirits might be brought to the Land of Darkness only briefly or not at all. They might be sent to Heaven to receive official posts, or to the Buddhist Western Paradise, or to Mount Kunlun, home of the Taoist Immortals. Lady Queen Mother. In The Journey to the West, the Lady Queen Mother is the wife of the Jade Emperor and lives in Heaven. Elsewhere she is often known as the Queen Mother of the West, ruler of Mount Kunlun, home of the Taoist Immortals. In either case, she tends the orchard where the Immortal Peaches grow. Monkey, by Wu Ch’êng-ên, translated by Arthur Waley, John Day, New York, 1943; reprinted by Grove, New York, 1958. Abridged. The Journey to the West, translated and edited by Anthony C. Yu, University of Chicago, Chicago and London, 1977. Four volumes. Journey to the West, by Wu Cheng’en, translated by W. J. F. Jenner, Foreign Languages Press, Beijing, 1982. Three volumes.